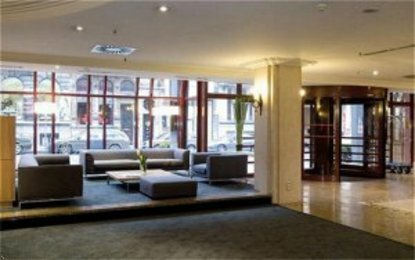 Holiday Inn Brussels City Centre is ideally situated at the heart of the Brussels business district, close to the elegant Avenue Louise and only 15 minutes from the airport. Our establishment's privileged situation makes it easy to reach many tourist attractions on foot, such as the Grand Place, the Royal Palace and Modern Arts Museum. Business travellers will appreciate the proximity of different European Community institutions, also of the City Hall and Brussels Stock Exchange. The hotel has 201 rooms, of which 131 are non-smoking rooms, and 4 large modern suites. All rooms are equipped with WiFi internet access, direct line with voice messaging, and feature a desk. Our restaurant "la Papelotte" with its bar-brasserie offers an ideal setting in which to relax and enjoy traditional and international cuisine. Holiday Inn Brussels City Centre has 555 m&reg of function space dedicated to business events, comprised of ten meeting rooms equipped with WiFi Internet access. Our large banquet room is highly flexible and can be adapted for different types of events, with a capacity for up to 200 guests. Several sports facilities are available close to the hotel and covered parking spaces are available to our guests 24/7.